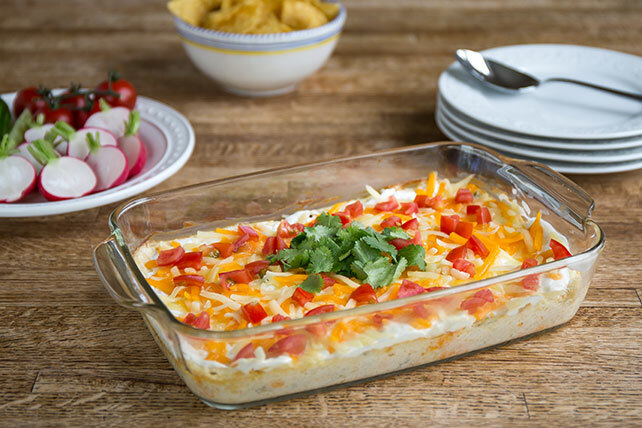 Make a festive-looking appetizer with our Fiesta Baked Cheese Dip. This baked cheese dip features chopped green chiles and a blend of shredded cheeses. Beat cream cheese in large bowl with mixer until creamy. Reserve 1/4 cup shredded cheese. Add remaining shredded cheese to cream cheese along with the chiles, 1/2 cup sour cream and ground red pepper; mix well. Spread cream cheese mixture onto bottom of 2-qt. casserole sprayed with cooking spray. Bake 20 min. or until dip is heated through and lightly browned around edge. Top with remaining sour cream, reserved shredded cheese, chopped bell peppers and cilantro before serving. Serve with assorted cut-up fresh vegetables, tortilla chips and/or your favorite crackers. Prepare in 10-inch pie plate or quiche dish. Substitute chopped green peppers, chopped tomatoes or sliced black olives for the red bell peppers, and/or sliced green onions for the cilantro.